Amherst (Mass.) 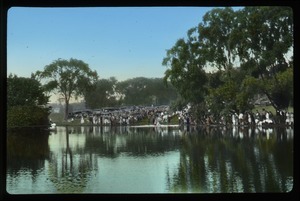 - Hand-colored image of crowd watching the rope pull contest at Massachusetts Agricultural College. Amherst (Mass.) 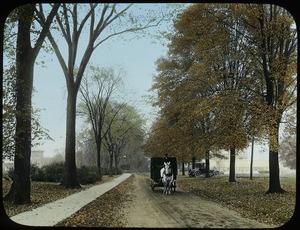 - Hand-colored image of horse-drawn wagon driving up tree-lined dirt road; French Hall is visible to left (image probably taken from near Waugh's home). Amherst (Mass.) - Hand-colored image of two young men (Waugh's sons?) 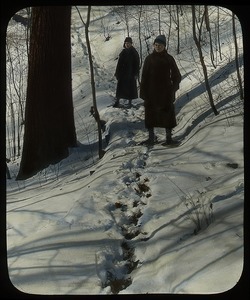 showshoeing on a path in the woods.